Excerpted. To read the rest of the review, visit Sweeping Zen. The paradox of a good inspirational wisdom book is that the moment you finish a page or two, you are compelled to put the book down, to stop reading and just live life. And what about a good wisdom book—on writing? It screams through its implications—throw me down! Why are you even reading me right now when you could be living the life of the writer? 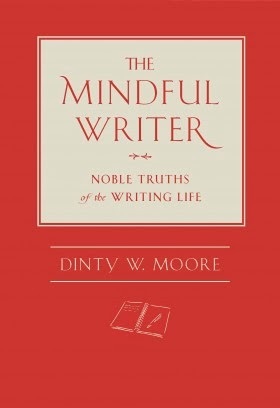 In the case of The Mindful Writer (2012), which I consider just such a book, Moore and the well-known authors he quotes and explicates compel us to just drop the book and live the moment—to notice the surroundings, to sit down at the writing desk, to catch a thought on the page and see where it might lead. Moore’s central assertion is that mindfulness is essential for a fruitful, truly satisfying writing life. Writing is life, and life is writing, and so it follows that what is true of every other aspect of life is also true of writing. Moore establishes this assertion by defining the mindful writer as one who remains “attentive to the task at hand, seeing the words that are before you, hearing the possibilities in your mind, not succumbing to the thousands of other willing and ready distractions” (7). The writing life is difficult, full of disappointment and dissatisfaction. Much of this dissatisfaction comes from the ego, from our insistence on controlling both the process of writing and how the world reacts to what we have written. There is a way to lessen the disappointment and dissatisfaction and to live a more fruitful writing life. Sometimes this “just sit” is over-interpreted. Just sit doesn’t mean just sit. It means that whatever you do you undertake with the same attitude of mind that you use when you are sitting in zazen. It doesn’t mean not reading or thinking or studying, much less not working with your hands or practicing an art. Kodo Sawaki and Nishijima and Deshimaru, all were deeply learned. Kodo Sawaki may have been called Homeless Kodo because he did not have a temple of his own, but when he traveled he was never without his case of books, an attachment his friends made fun of. You know the depth of Deshimaru’s learning from my edition of his commentaries on the Heart Sutra. And when I first read Dogen’s Shobogenzo it was in Nishijima’s four-volume translation. So I thought it might be a nice gesture to show up at the memorial in Santa Monica. A nice gesture, but to impress whom? Maybe if I hadn’t anything else to do. It is more appropriate that I am here for the first sitting in our new space. This is a much better way of memorializing and remembering a master who is no longer here. After all, he is just as not here in Bakersfield as he is not there in Santa Monica. And after all, our zazen is the best way of embodying what Nishijima and Deshimaru and their teacher Kodo Sawaki were all about. We live in the here and now. Much better to do something for the living than for the dead. That doesn’t mean though that we throw out the past. It doesn’t mean we throw out the past masters of the lineage. On the contrary: Nishijima, Deshimaru, Kodo Sawaki, they were just like the Buddha, just like Bodhidharma, just men, just people, just human beings, just like us. The best way to remember them is to live our lives. The best way to live our lives is to do zazen. The best way to do zazen is as nothing special. This is our first day in this new space but it is always the first day. 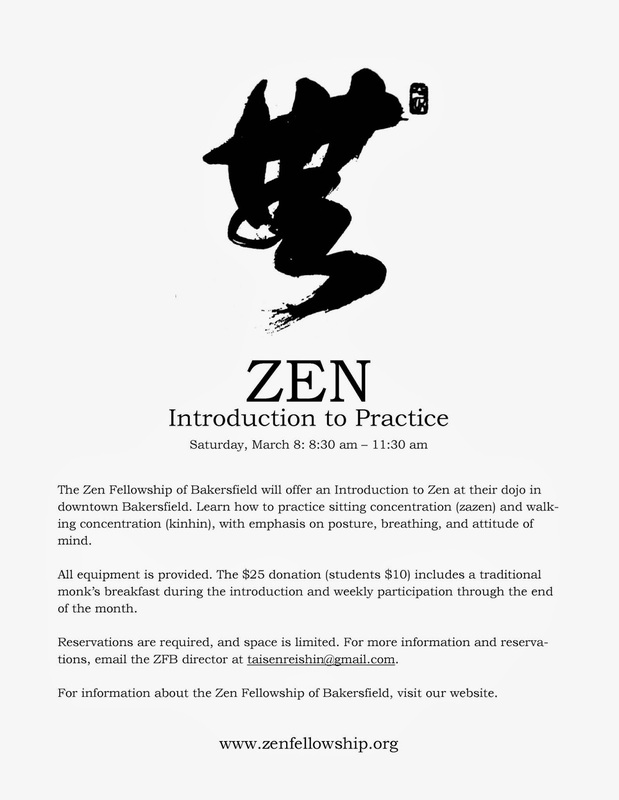 Every zazen is the first zazen in a new space. Always remember: posture, breathing, attitude of mind. Mushotoku attitude of mind, no personal profit, no personal gain. That’s the entire formula for zazen, the entire secret to Zen practice, very simple. Don’t complicate it. Complications are an expression of the ego, the very opposite attitude of mushotoku. We want things to be more complex so that we can figure them out, like Oedipus solving the riddle of the Sphinx. We want our lives to be more tangled, more neurotic, like Woody Allen, because we think that makes us more interesting. We want our reactions to be more extreme because we think that makes us more passionate and therefore more alive. But that’s not true. More complexity, more neuroses, more extreme emotions really show us how desensitized we are to the subtleties of others and involve us in our own delusions. See for yourself, though. Drop off these delusions in zazen and see for yourself whether that makes life more interesting and you more alive, or duller and deader. That’s the only test. Nishijima is dead. The question is: are you more alive than he?